Crepes.. Those delicate lacy handkerchief thin wisps of cooked batter, slathered with delicious Nutella, the kind of stuff that seems to be possible to savor & enjoy in restaurants , food trucks and any other food establishments, EXCEPT the home! To be honest, I've never attempted making a French crepe, or entertained the possibility of even trying. For one thing, my neurotic avoidance of using eggs and second, the general aura of the whole crepe making process. The egg phobia thankfully, seems to be getting relegated to the past, with credit going to OXO for getting me to try some of their egg related tools. The recipes are slotted for future posts. I've been a fan of OXO tools ever since my dad bought me a pair of OXO knives while settling me in Grad school at NYU (sometime in the last century). over the years, I've added a vast array of OXO tools to my collection and have never been disappointed with ANY of my purchases. SO when OXO sent out a set of their latest tools for working with eggs, I was more than happy to put the tools to good use. I already had an egg beater in my arsenal and OXO has graciously let me give away the one they sent me to one lucky reader in the US of A. 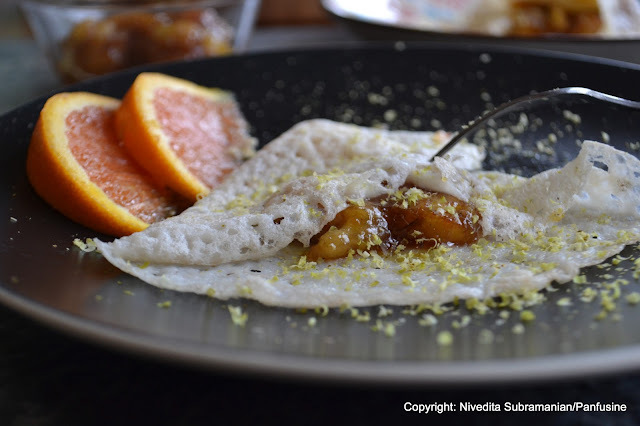 Growing up, my mother would occasionally whip up these magical rice dosas which would be eaten along with a Tart tamarind dip made with fire roasted eggplants. 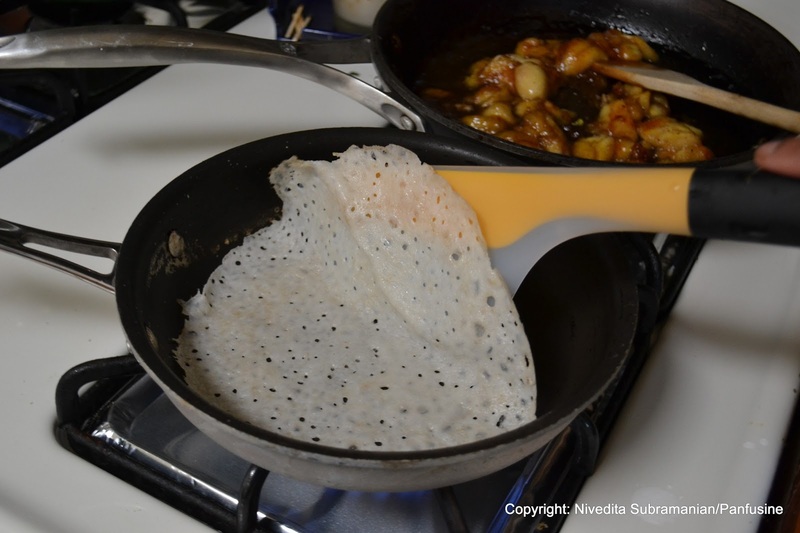 They were known as 'Kali Kanji dosai' or 'verrum arisi dosai' depending upon whether I asked my mother or Paternal grandmother respectively (which in turn reflected their district of origin in South India). The batter was made of rice, water and salt, thats it. The trick to make the starch bind into a crepe was to boil some of the batter (the stuff stuck to the blender jar) into a syrupy broth (the Kanji) and mix it with the rest. This makes the batter gel up into a crepe. The best part of the crepe is that it pairs equally well with savory or sweet fillings. I've tried this with warm Jack fruit Pate as well as caramelized bananas spiced with cardamom and frankly loved them both equally. Microplaned pistachio nuts for garnish. Wash & soak the Basmati rice in adequate quantity of warm water for about 3 hrs till its softened. Transfer the soaked basmati with as little water as possible to a blender jar & grind completely into a very smooth (& extremely thick) paste (it'll have the consistency of wet concrete). Add a cup of water to dilute the paste & give it a whirl in the blender to dislodge the thick rice paste. Transfer the batter into a container. lightly scraping out the sides of the jar. Add the second cup of water to the blender jar & completely wash out the remaining rice sticking to the sides, lid & blades of the jar. Transfer this liquid to a separate container & SAVE. Transfer this washed out rice liquid to a saucepan and bring to a boil. The liquid will take on a syrupy appearance, due to the starch swelling up (similar to what happens when you cook oats). Remove from the stove & strain this liquid into the batter. Stir to eliminate lumps. The consistency should be like that of crepe batter. (should have a yield of about 3 cups (~ 24 oz) of batter. Add the salt, confectioners sugar (adjust to your personal level of sweetness and omit for savory fillings) and the yeast or baking powder. beat thoroughly to eliminate lumps and allow to rest for about 10 minutes. Heat a 6 inch nonstick skillet over the gas. Rub the melted butter over the surface of the skillet to season it. Wipe uniformly over the hot surface using a paper towel. Using a (1 oz) coffee scoop spoon, pour 2 scoops of the batter ( whisk the batter well before using each time, the rice tends to sink to the bottom) into the skillet. Using the wrist, swirl the batter around the base & the sides of the skillet to coat evenly. Cover & cook over a medium heat for about 1-2 minutes till the edges begin to brown & leave the surface of the skillet. '. 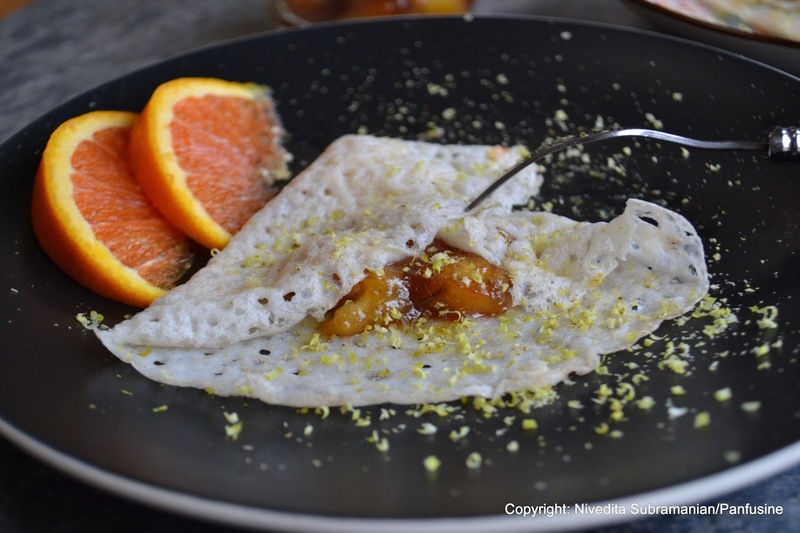 Gently dislodge the crepe from the sides of the skillet & slide it onto a serving plate. The Omelet spatula is perfect for dislodging the crepe and flipping it over. Spoon about a tablespoon of the caramelized banana filling onto the center of the crepe and gently fold the crepes over. Garnish with the microplaned Pistachio shavings and serve warm. Now for the details on the Giveaway. 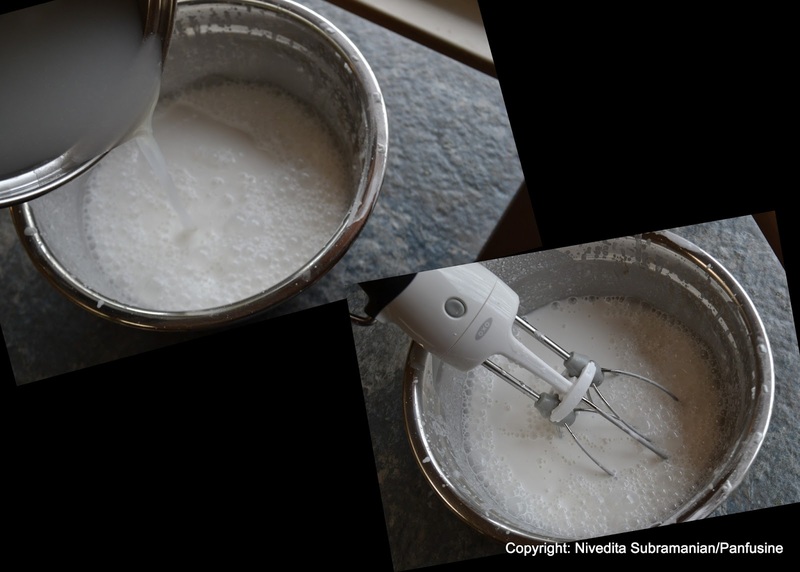 I have ONE egg beater that Oxo has allowed me to send to a lucky reader. I can only ship within the USA for this particular giveaway, but hopefully there will be others for all those of you around the world in the days to come. To enter just follow the directions on the 'Raffle copter' box below. Good luck! I don't have any OXO tools. This would be a first! Recipe Looks great! Yummy! I love my OXO vegetable peeler. love the pear corer too! I don't own anything from OXO yet. Thank you for the chance! 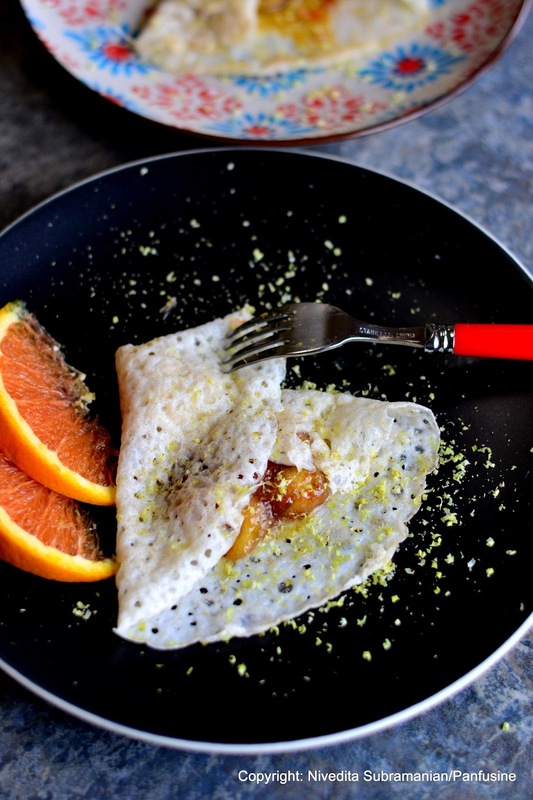 Love your rice crepes. And would love to get an OXO tool as well.